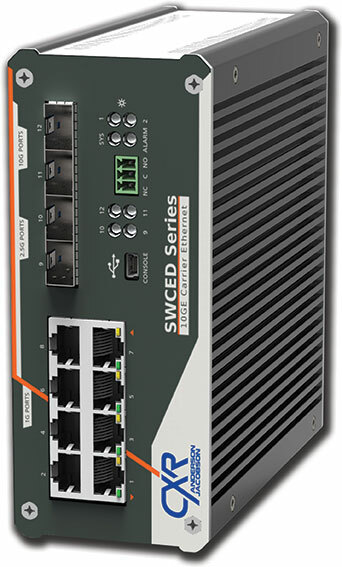 SWCED-2112 is a ruggedized 10 Gigabit Ethernet switch and EDD Ethernet Demarcation Device in a DIN rail format that provides 2x 10GE SFP+ slots, 2x multi-rate 2.5GE / GE / 100FX SFP slots, and 8x Gigabit Ethernet RJ45 ports. 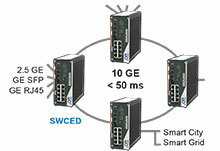 SWCED is based on last generation Ethernet communication processors and ASIC. It embeds a number of hardware accelerators for wirespeed Ethernet switching and Operation And Maintenance traffic control (OAM). This Service-Aware Architecture provides the SWCE with best performance whatever traffic load and system configuration especialy with large number of VLAN's, ACL rules, Ring protection instances and OAM services. MEF CE2.0 (EVC, OAM) functions can be activated by a software license when new required are raised. With that cost effective approach, you get a very high performance equipment that suits both current and future requirements. Native standards for traffic management and Operation And Maintenance functions - OAM. SWCED is a high reliability industry grade design. It comes with one or two load-charing 24-48 Vdc power converters for best power failure resiliency.